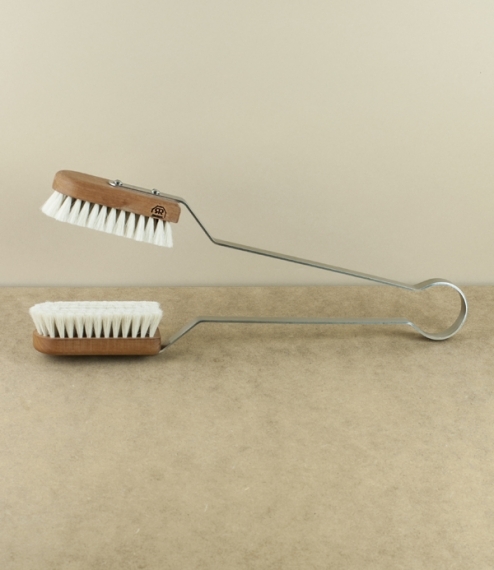 A pair of soft goat-hair and pear-wood brushes mounted upon stainless steel tongs allowing for the easy and scratch free dusting of broad leaved houseplants and vinyl records, as well as the gentle removal of aphids from leaves and stems. Made to an early twentieth century design in the Versmold workshops of the Redecker company, who since their founding by Friedrich Redecker in the 1930 have specialised in the production of unusual and high quality brushes, made using traditional techniques and largely natural materials. Overall length about 35cm.